Can Merkel Bring Trump to Reason? The world already knows how Angela Merkel feels about Silvio Berlusconi. The former Italian prime minister allegedly sought pleasure with underage prostitutes, he wasn't particularly fastidious about the rule of law and he sought to grin away his country's problems. Italian newspapers also reported a few years ago that he made some rather untoward remarks about the German chancellor's posterior in a telephone conversation. Berlusconi was precisely the kind of politician Merkel abhors. Nevertheless, she usually got what she wanted from him. At an EU summit in December 2008, she deployed a mix of charm and toughness to secure his agreement on her climate policies. It was a fabled event, and diplomats still tell stories today about how she wrapped the vain Italian leader around her little finger. Merkel's people are hoping for some similar magic at an upcoming encounter that will be even more sensitive. On Tuesday, she will meet with U.S. President Donald Trump in Washington, D.C. It will be the first in-person meeting between the two since the U.S. election in November. And it could be the most difficult meeting Merkel has ever faced as chancellor. The two couldn't be more different. On the one side is an unsophisticated yet self-absorbed political neophyte who has made it clear that there is nothing he won't sacrifice to achieve what he sees as America's interests. On the other is one of the most experienced leaders in the world, one who many see as being the last defender of democracy and Western values -- a view that Merkel herself considers to be a dangerous misjudgment given the limits of German power. Indeed, she calls it "absurd." The task at hand could hardly be more important. Trump is not only the most powerful man in the world. He has also shown that he cares nothing about the rules of Western political game. His plans could rupture the European Union and weaken Germany economically. Trump has announced that he plans to fight Germany's export surplus. And although his statements on NATO have been contradictory, it is clear that he wants alliance partners to increase their defense spending. Plans for his foreign policy with Russia are also half-baked. Will he back the Western sanctions against Moscow that Merkel worked hard to implement? Merkel and Trump will have no lack of issues to discuss. But sources close to Merkel are certain about one thing: The chancellor will seek to establish a good relationship with the president. Trump relies less on the traditional mechanism of politics than his predecessors and he often makes decisions impulsively, without regard to well-established procedures. "Trump's actions are driven more by his instincts and business experience than by political rationality," says Norbert Röttgen, the foreign policy spokesman for Merkel's center-right Christian Democratic Union (CDU). He traveled to Washington a few weeks ago for talks. "That doesn't make dealing with him any easier." Merkel doesn't want to rely on a charm offensive alone. She's also prepared to stand her ground on some issues, especially trade policy. The chancellor will be accompanied on her trip by Siemens CEO Joe Kaeser and BMW head Harald Krüger according to an agreement she reached with US Vice President Mike Pence at the Munich Security Conference in February. Kaeser and Krüger are to explain to Trump how many jobs and training positions their companies create in the United States. The president has greater trust in executives than politicians and Merkel is hoping that Trump will listen to the heads of two blue chip Germany companies. In terms of foreign policy, Merkel is said to be less pessimistic than she had been right after Trump's election. Thus far, the president hasn't moved to implement his most radical demands. The nuclear deal with Iran is still in place and the idea of moving the U.S. Embassy from Tel Aviv to Jerusalem has been delayed for now. The clarity with which U.S. representatives at the Munich Security Conference in February expressed their support for NATO also calmed some of the worst fears. Officials in Berlin believe that Defense Secretary James Mattis and Secretary of State Rex Tillerson will lean much more toward pragmatic realpolitik than initially feared. In addition, Trump's new National Security Adviser Herbert Raymond McMaster is regarded in Berlin as being much more calculable and well-informed than his addled predecessor Michael Flynn, who was forced to step down because of his misrepresentation of contacts he had with the Russian ambassador to the United States prior to the election. During a video call with McMaster, Merkel's foreign policy adviser Christoph Heusgen's impression was of a man firmly rooted in traditional Republican foreign policy and that McMaster is someone Germany can work well with. Merkel has been studying Trump from afar. She has watched his speeches and she is certain that he intends to do what he can to fulfill his promises. She is also convinced that direct contact with Trump is vital, something she realized during an extensive phone call she had with him on Jan. 28, during which she explained the Ukraine conflict to the new president. That Saturday afternoon, the president telephoned first with Merkel and afterward with Russian President Vladimir Putin. Officials in the Chancellery believed that the Americans had arranged the sequence intentionally so that Trump, a Putin admirer who has spoken out in favor of a new deal with the Kremlin, could first get an introduction to Russian policy from Merkel. It appears that less Moscow-friendly actors in Washington hoped that the strategy might help prevent Trump from getting too close to Putin. The plan seems to have worked. Since then, hope has been mounting in Berlin that Washington, even under Trump, will continue to back the Minsk peace process and that it will not move unilaterally to lift sanctions. Merkel also sees it as a good sign that Fiona Hill, a recognized expert on Russia who is also a sharp critic of Putin, was appointed to the National Security Council. Merkel is hoping to see the same kind of shift on a host of other issues important to the international community, including the Iran deal, the situation in Libya and climate change. She also plans to explain the tenets of the European Union to the president. Officials in Berlin say that a person who found it surprising after the election that the promises he made about U.S. health care policy would be difficult to implement may have some catching up to do on other issues as well. The trick will be finding the right tone -- to teach without sounding pedantic. "We have to fight for the trans-Atlantic relationship by proposing projects that will lead to mutual success," says Röttgen. That is Merkel's view as well. She is likely to point out to Trump, for example, that Germany has already begun implementing the U.S. president's demand for increased military spending. Even though there is cautious optimism in the Chancellery about foreign policy, Merkel and her staff are preparing for the worst when it comes to trade. Even as vague as they may still be, Trump's plans could become the greatest threat to the global economy since the financial crisis, with Germany standing directly in the firing line. Almost 50 percent of all jobs in Germany are dependent on exports. The Americans alone last year purchased 107 billion euros worth of German goods, whereas only 57 billion worth of U.S. goods got imported to Germany. The country would suffer severely if the U.S. started a trade war with Europe or China. In order to assuage Trump, Merkel is deploying a dual strategy. In addition to her charm offensive, she also wants to send the message that, if push comes to shove, she has a nastier side as well. On the one hand, Merkel wants to emphasize in the meeting the significant degree to which the Americans also benefit from good trans-Atlantic relations. German Economics Minister Brigitte Zypries put together a package of data for the chancellor following a meeting with trade associations last week. It shows that one-third of German foreign investment flows into the United States. It also shows that German car companies now manufacture more automobiles in the country than they export to it from Germany. But what happens in the likely event that Trump sticks to his "America First" plans? If that happens, then Merkel is expected to push for a united EU front to blockade Washington. At a summit in Brussels on Thursday, Merkel noted, "We renewed our support for free trade." A few days earlier, European trade ministers met for a working lunch in Brussels and agreed to a joint position. The agreed that the EU should not fuel the conflict, but it should prepare for the possibility of a trade war with the United States. The goal, in such a case, would be that of isolating the U.S. EU Trade Commissioner Cecilia Malmström was asked to begin negotiating further agreements with other countries and regions of the world. She is currently touring the Far East in order to expedite current talks on trade agreements with Japan, India and Australia. At the same the, the EU countries are pushing ahead with their plans for public courts that would arbitrate conflicts relating to controversial investment projects. It's an initiative that the Trump administration wants to put a stop to at all costs. Trump's trade policy adviser Peter Navarro has been the most outspoken about calling Germany the enemy. The Harvard graduate views it as a "serious issue. Germany is one of the most difficult trade deficits that we're going to have to deal with but we're thinking long and hard about that." He has also accused EU politicians of deliberately devaluing the euro to give European exporters a price advantage over their American competitors. Even before Trump's election, Navarro had been considered an outsider with his views. Now he's the president's chief ideologist on trade. Many of Trump's allies are pushing for a radical tax policy measure to stop the stream of goods from abroad, a measure referred to in official jargon as a border adjustment tax -- a plan whereby exports would be exempt from taxes but companies would not be able to deduct money they spend on imports.. "We are taking this very seriously," says one high-ranking source in the Chancellery. On her first visit with Trump, Merkel plans to be very open about her views on the tax plans. Her preparatory paper for the meeting states that she plans to call the punitive import measure a "protective tariff" and the tax relief for American exports a "export subsidy." She views both as being hostile acts that could trigger a trade war. Merkel also plans to note that a levy like that would violate the pre-existing tax agreement between Germany and the U.S. They would also be out of compliance with World Trade Organization rules. The implicit threat is that Germany would not shy away from lodging a complaint with the World Trade Organization (WTO). If none of that bears fruit, the Chancellery has begun reviewing ways it could strike back at the U.S. One idea would be to incrementally increase duties on American imports. Agreements reached within the World Trade Organization framework provide enough maneuvering room to allow for that. Another possibility would be to allow German companies to write off the U.S. import tax on their German tax declarations, thus compensating them for their competitive disadvantage. Ultimately, Germany could also take a bigger step: lowering corporate taxes and the amount of social contributions employers are required to pay here. Both would make Germany more attractive to international corporations, but they would also cost tax payers billions of euros -- initially at least. As the defenses are mounted against Trump, Merkel is counting on the European Commission, which recently said it wants to significantly bolster its arsenal for potential trade wars. Last November, the EU executive paved the way for improving its defense instruments, which it had originally planned to deploy against China. But they might also help bring Trump to reason if they are approved by the European Council, the powerful body comprised of leaders of the EU member states, and the European Parliament. Furthermore, the EU has long been investigating Google for competition violations and other companies such as McDonald's and Starbucks for tax-evasion models. If need be, those investigations could be broadened at any time. Merkel is hoping things won't get that bad. Her trip would already be considered a success if she were able to find a reasonable basis for discussion with the U.S. president. 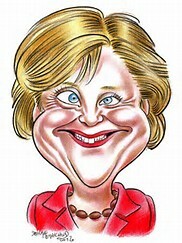 At the same time, Merkel is up for re-election in September and she will also have to keep voters in Germany in mind. She can't alienate the new president, but it also wouldn't play well domestically if she allowed herself to be treated as a supplicant the way British Prime Minister Theresa May recently did during her visit with Trump. The fact that a discussion in the Chancellery is even necessary regarding how far the chancellor can go in her criticism of Trump's violations of Western values and principles is in itself indicative how the situation has changed. In the past, these were the kinds of considerations that Merkel's staff made prior to trips to Russia or China. Now it's the government in Washington, once one of Germany's closest partners, that worries the government in Berlin. "In terms of international policy," Merkel adviser Röttgen says, the U.S. has now become an "element of uncertainty of a structural nature."